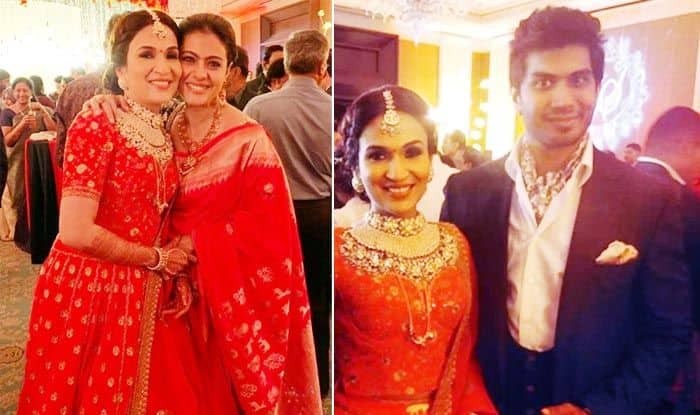 Check out all the inside pictures from Soundarya Rajinikanth-Vishagan Vanangamudi's wedding reception. Superstar Rajinikanth’s daughter Soundarya Rajinikanth tied the knot with Vishagan Vanangamudi in Chennai. The couple hosted a grand reception which was graced by many renowned faces including actress Kajol. The newlyweds looked like the match made in heaven. Soundarya wore a red lehenga and accessorized with heavy diamond jewellery. She was the epitome of grace and elegance. Vishagan looked dapper in black. The pictures doing the rounds on social media indicate that celebs enjoyed the night. The wedding ceremony of the couple was attended by many prominent names from the Tamil film industry including Kamal Haasan. Soundarya’s attire was designed by Abu Jani & Sandeep Khosla. She completed her look with a diamond necklace, a kamar bandh and diamond bangles. This is Soundarya’s second marriage. She was earlier married to businessman Ashwin. Soundarya announced in the year 2016 that she and Ashwin had filed for divorce after four years of their marriage by mutual consent due to irreconcilable differences. She made her directorial debut with Kochadaiiyaan. She last helmed Dhanush and Kajol starrer Velaiilla Pattadhari 2.